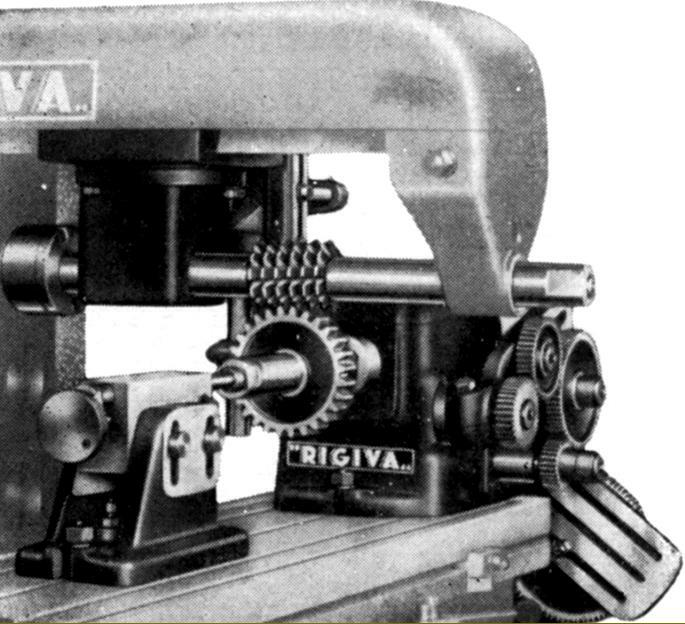 In addition to their ordinary products, Riva (who had strong connections with the local textile industry) also made a number of highly specialised machine tools for that trade. They also offered die sinkers, auto-cycle and hydraulic-copying millers, cam milling and cam grinding machines and bespoke solutions for engineering companies that required one-off or unusual milling-machine, fittings or modifications. A compact but heavy (750 kg) miller, the U2 was ideal for general machine shop use - or for smaller jobs in a repair facility. Fitted with a 700 x 200 mm table, with three 12 mm T-slots on 12 mm centres, power feeds were provided in all three directions - an unusual luxury on this class of machine - driven by a separate 0.5 h.p. electric motor and oil-bath gearbox. The table on the U.2 Universal could be swung 45° in each direction from central, that on the U.O being fixed. Longitudinal, traverse and vertical movements were, respectively, 470, 240 and 350 mm with 12 rates of automatically disengaged feed provided: feed rates for both horizontal directions spanned 10 to 500 mm/min and the vertical 4 to 200 mm/min. Rapids were also fitted to each axis, with a long, horizontal lever controlling a multi-plate clutch to give a single rate of 1600 mm/min for cross and long and 650 mm/min vertically. Unusually large-diameter handwheels were provided (with one half of each left solid to provide a flywheel effect) the table being fitted with one at each end (no penny-pinching, one-end-only fitment here) and with that for the knee elevation being fitted facing forwards and exactly level with that for the cross feed. Spindle drive was from a 2-speed, 1.35/0.75 h.p. motor held in the base of the cast-iron main column with V-belts turning a built-in reduction gearbox containing hardened and ground gears lubricated by splash. The hardened, chrome-nickel spindle (running in high-precision adjustable taper roller bearings) had 12 speeds spanning a most useful 75 to 1500 r.p.m. - this wide range rendering the machine capable of mounting and using effectively a good range of tooling from wide slab cutters to thin slitting saws. A very wide range of accessories was listed, all appropriate in size for the model including five vertical heads the Types T.V.2, T.M.2, T.U.2, T.V.U. and M.2. The first three all had a No. 3 Morse taper quill and, being driven directly from the horizontal spindle, the same speed range of 75 to 1500 r.p.m. 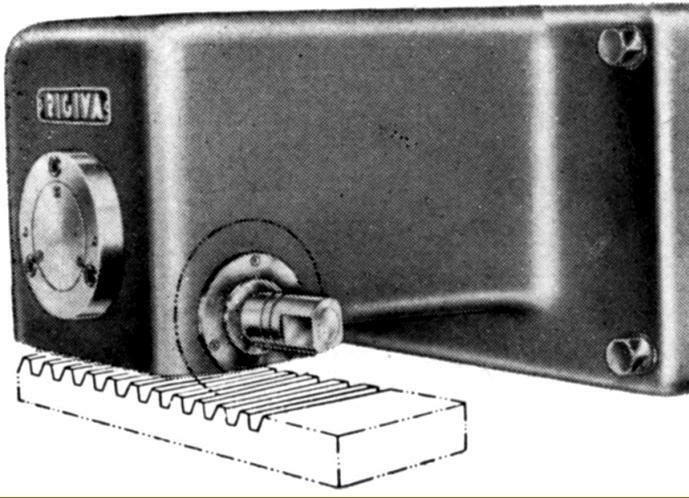 The Type T.V.2 was a plain model, with a pivoting end section, while the T.M.2 was almost identical but fitted with a lever-action quill. The T.U.2 was a universal type, with a double axis swing - but no feed. 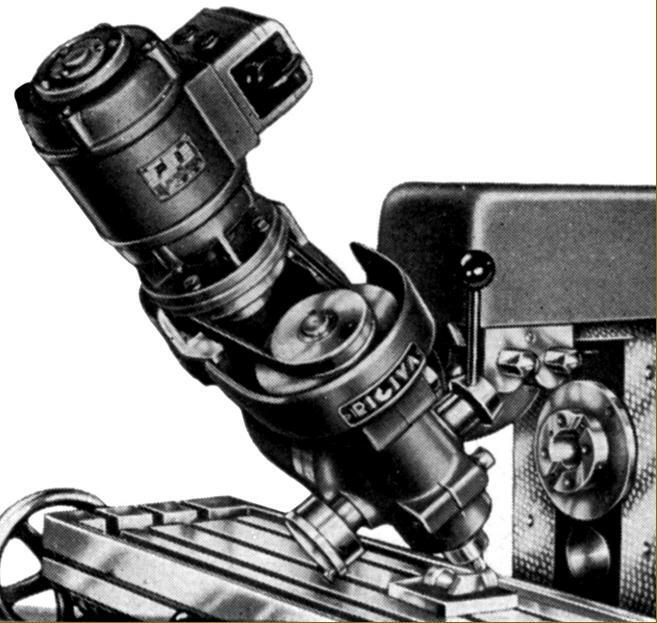 A universal high-speed type (used unaltered on all sizes of Riva millers) the T.V.U., had a lever-action quill with the spindle driven by its own 2-speed, 0.6/0.4 h.p. motor that gave, via V-belts, speeds of 500, 750, 1000, 1500, 2000 and 4000 r.p.m. 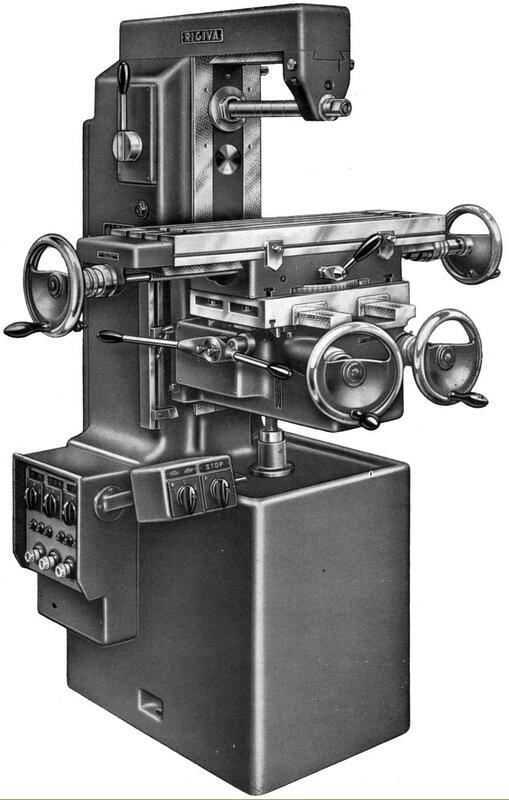 An inclinable slotting head, the M.2 had a stroke travel adjustable between 0 and 70 mm. A particularly effective 90 mm centre height Universal Dividing and Spiral-milling Head was offered, driven from gearing at the right-hand end of the table. 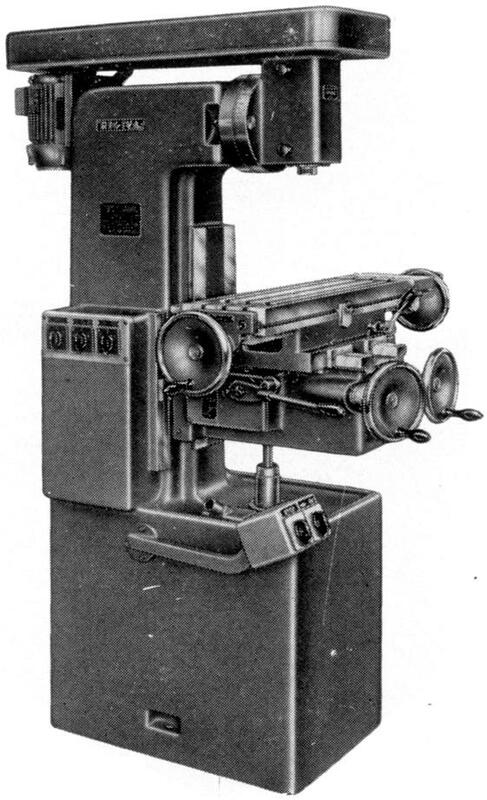 Its spindle revolved in roller bearings and it came complete with 2 indexing plates, an adjustable intermediate rest, two centres, a catchplate, an extension arm to carry gears for differential indexing, 13 gears and a set of ready-reckoner tables for performing divisions - with 2200 already calculated for spiral pitches. For hobbing (cutting straight and helical gears, worms and splines, etc.) 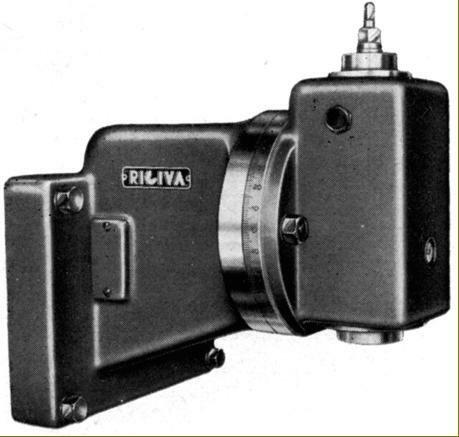 Riva supplied a 125 mm centre height, self-contained attachment the Type D.130 that was also powered from gearing on the right-hand end of the table. 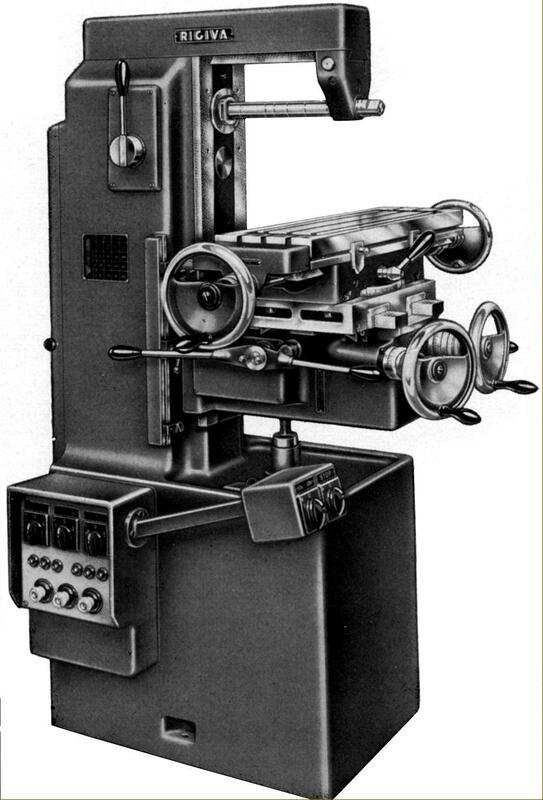 A special attachment, designed exclusively for rack and worm milling, was the Fixed Vertical Head Type C.R.2. This could handle Modular gears from 0.5 to 2.5 and DP equivalents and was available with a special holding attachment to fit on the Universal Dividing Head. Two rotary tables were offered: the T.G.225 with a diameter of 225 mm, a No. 4 Morse taper hole in the middle, an indexing plate and a helical gear ratio of 1 : 60. 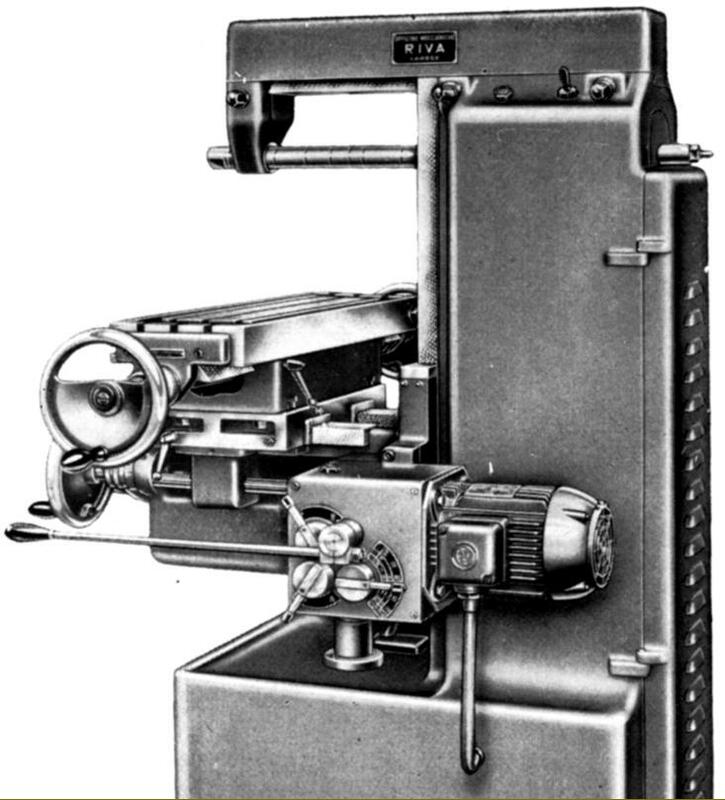 The other type was the T.G.C, a freely rotating model mounted on a T-slotted base and intended for die and punch work. A useful 300 mm x 160 mm inclinable Universal Table mounted on a circular base engraved 360° was available (with all settings by hand) and a superior 300 mm x 125 mm Driven Universal Table with a 360° swivel base and the ability to be inclined through 5° either side of horizontal by handwheel operated worm-and-wheel gearing. 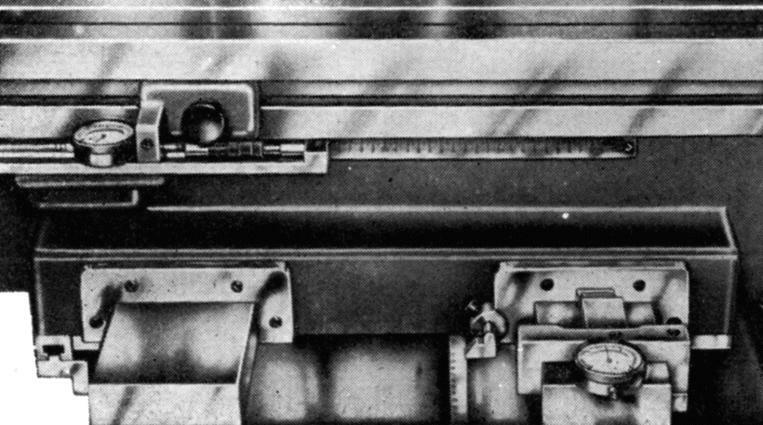 Fitted with a vertical head driven by V-belt from a rear-mounted motor, the Riva V.2 vertical used the same 700 x 200 mm table and knee assembly fitted to the U.2/O/2 models - but with the horizontal travels slightly reduced at 400 mm longitudinally, 200 mm in traverse - but increased vertically to 400 mm. Using a 1/3 h.p. motor speeds from 210 to 2500 r.p.m. were available, the top cover hinging open to allow the belt to be moved from pulley to pulley. 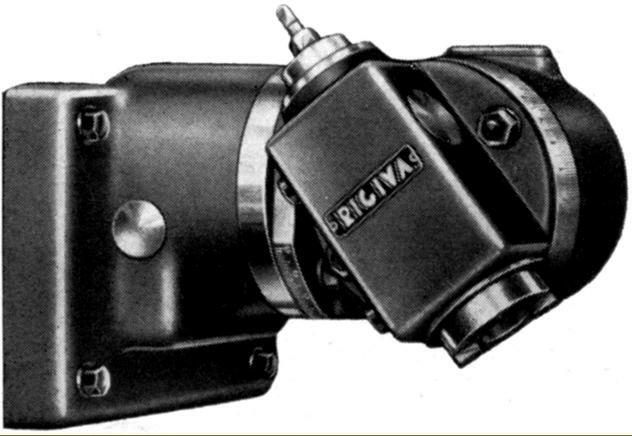 This High-speed Milling Head was used, unaltered, on a wide range of Riva millers. It changed a little in design over the years and was available with a number of mounting options including a bolt-straight-to the-face type, with a supporting right-angle casting or with a double-swivel mount. 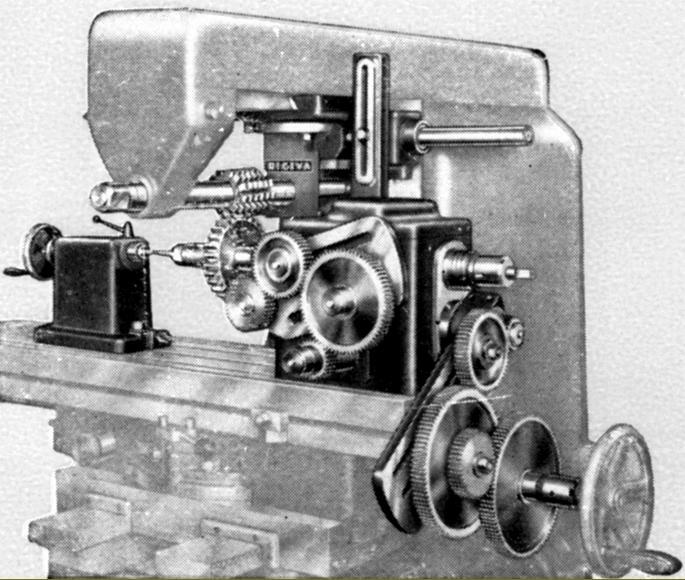 The 2-speed, 1/0.75 hp motor carried a 2-step pulley that drove rearwards by V-belt to jockey pulley that had 2-speed drive forwards by V-belt to the lathe spindle. 8 speeds were provided of 150, 220, 300, 440, 700, 1000, 1400 and 2000 r.p.m. Double-swivel Vertical head Type T.U.4 with a No. 3 Morse taper and speeds from 70 to 1500 r.p.m. 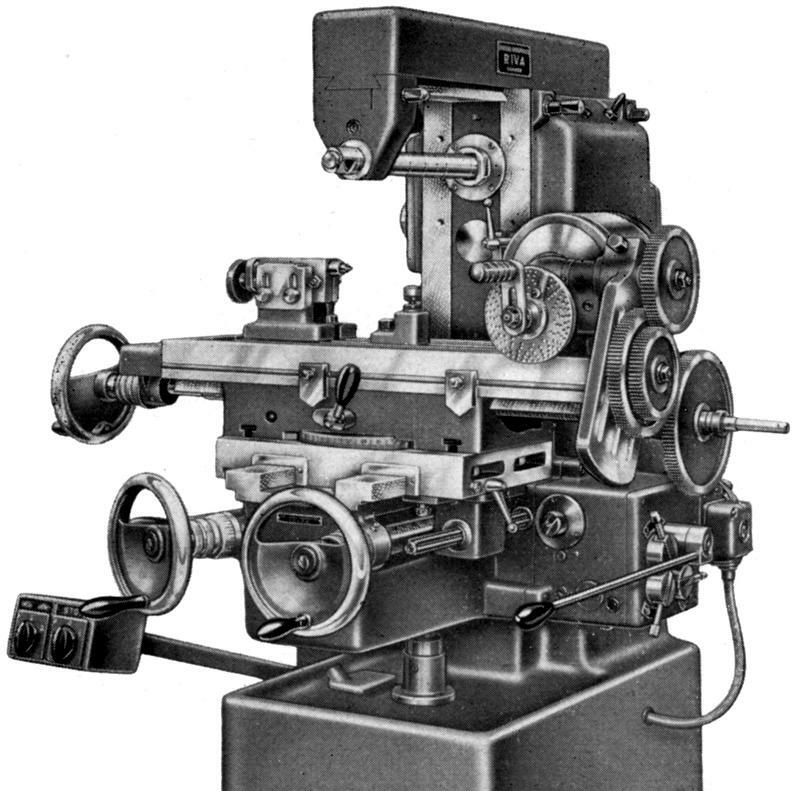 Swivel-end Vertical Head Type T.V.2 with a No. 3 Morse taper and speeds from 70 to 1500 r.p.m. For hobbing (cutting straight and helical gears, worms and splines, etc.) 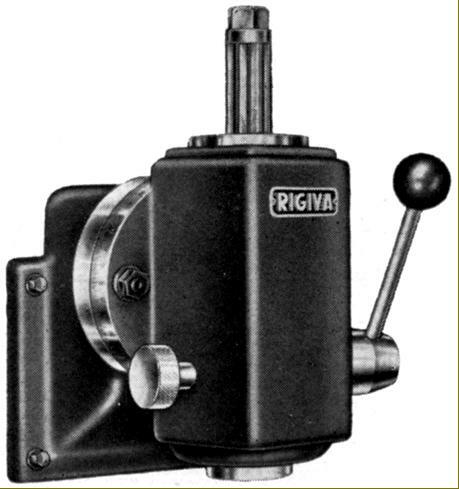 Riva supplied an automatic dividing attachment in various sizes: D.130, D175 and the D.175.70 - with centre heights matching the model number. The dividing unit was driven from gearing at the right-hand end of the table with the head section clamping to the V-ways underneath the overarm..
A special attachment, designed exclusively for rack and worm milling, was the Fixed Vertical Head. Type C.R.2. 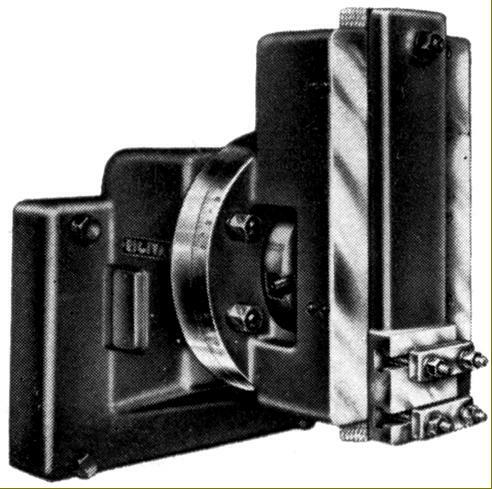 This could handle Modular gears from 0.5 to 2.5 and DP equivalents and was available with a special holding attachment to fit on the Universal Dividing Head. The 90 mm centre height Universal Dividing and Spiral-milling Head. Driven from gearing at the right-hand end of the table its spindle revolved in roller bearings. It came complete with 2 indexing plates, an adjustable intermediate rest, two centres, a catchplate, an extension arm, for differential indexing, 13 gears and a set of ready-reckoner tables for performing divisions - with 2200 already calculated for spiral pitches.